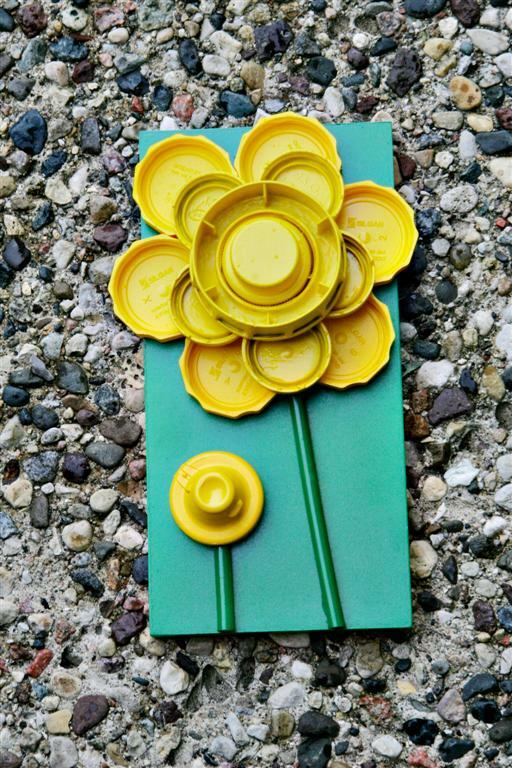 Another flower wall-hanging made from the lids of recyclable bottles. You can see my first one here. The scalloped lids around the base come from something we buy frequently but right now I couldn't say what. The second tier of petals is milk bottle lids. I have a fondness for Tropicana's Simply Orange and so the big center lid is from a Tropicana Simply Orange drink. The bud is a French's Mustard cap. If you want to use the rest of the bottle you could always make a dress form model like I did. The base is from some pre-fab shelves (no idea what such a small piece is for) and the stems are once again, straws. 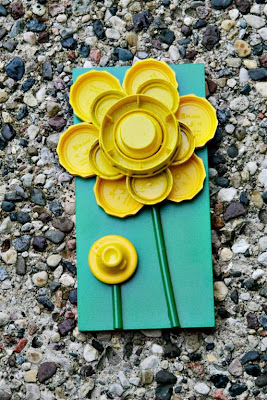 I love this idea, I can think of so many bottle caps to use and turn them into so many pretty flowers. I can't wait to try this. I also loved your dress from model. Very cute ideas. I can't believe the cute things you make out of what I throw away without a second thought. You are very creative. You can see past the obvious and truly find the art. I love the dress form and I really love that nothing goes to waste. Thank you for visiting my blog and you kind comments. A mustard cap?! That's too cute! and fun to boot! The yellow makes such a statement. Very fun. That is a great idea, how cute for a kids room! Oh that is just TOO. CUTE. This is too clever! I love the mustard lid bud. Now I'll just have to start saving lids of my own! Stopping by from the Weekend Wrapup. Have a great weekend! Stupendous, Melissa, I love the concept and the gorgeous result! I really love how green and whimsical this is. What a great idea for using up those bottle tops! Fabulous work of art!